I took a couple of pictures at market the other day. It was a great market day with a good turn out. What you don't see here are the other produce vendors, the baked goods, the pretzels, beef jerky, hometown apparel, and the home made dog treats that are at the market every Saturday. There were craft vendors in the front and back of the main market, and when it started to look threatening, our fearless leader Stacy Rutherford made sure that the crafters without tents got under cover, making a third row in the center. That worked pretty well! I've done a lot of craft fairs, and have never seen an organizer help people move their booths under cover when the weather turned. I mean, she was carrying their stuff! Anyhow, another great day at market :-). It has been a goal ever since the row of Grosso lavender went in, that some of it would be distilled. Now we are nearing a critical stage where all of the lavender is trying hard to bloom, so today was the day. It was an interesting distillation. Normally, we fill the little white bucket with ice, and just about the time the ice is all melted, we have 16 oz. or so of distillate. Of course, we normally have only a few drops of essential oil - sometimes none, depending on the plant used. So, I'm still scratching my head trying to figure out where the water went. Maybe the lavender in the biomass flask soaked it up? Anyhow, it took us quite a bit longer than usual to get a decent amount of distillate, and we had to refill the bucket with ice. We got more essential oil than even mints or lemon verbena. I took pictures as we went along, just because it was so darned cool! First, the lavender still on the plants. There are still several plants waving around out there, but 3 of them got good haircuts. This is one of "the girls" after the haircut. Next, you can see the amount of lavender that was cut compared to the biomass flask - which holds about a gallon, give or take. We only used the tops of the spikes, or the flowers. This is how it looks all ready to be fired up. The cloudy band in the collector is the essential oil. Gradually the cloudiness went away (air bubbles, I think) and the band got wider, to about 3/4 of an inch. Here you can see how dark the water got in the boiling flask, how pale the lavender got, and how much essential oil we obtained. The two blue bottles are hydrosol. So that's it. The still is all cleaned and ready to go for another adventure. The Essential Herbal in the news again! Tina Sams, a regular stand holder at the Mount Joy Farmer's Market, held a book signing there on Saturday, June 14 for her new book. "Under the Sun" is a compilation of the first five years of the author's "Essential Herbal" magazine.Sams began the magazine in 2002, and it grew from a newsletter to a 32-page magazine published every two months. It includes articles, recipes and ideas for health, first aid, gardening and crafts, all concerning herbs, by writers from across the country. Sams said she compiled most of the articles from the first five years of her magazine because the material was great, but few people had the opportunity to see it. "I just want people to learn," Sams said. "People will spend $20 on something they could pick in their back yards. If we were to walk down this [Appletree] alley, we would find five or 10 useful herbs." The author noted a few everyday herbs that can be used for a variety of purposes. For instance, she says plantains can help to quickly clear up a bee sting, and the herb grows pretty much everywhere not sprayed for weeds. Also, elderberries can have antiviral properties and coat cells. However, most doctors are unlikely to recommend these treatments. "If a doctor tells you to use something with herbs that's not approved by the FDA, they could lose their license," Sams said. "Under the Sun" was published by the Sibling Group of Manheim. The book will be available for purchase at the market stand shared by Sams and her sister, Maryanne Schwartz. Schwartz owns Lancaster County Soapworks and sells her wares alongside Sams', which include everything from "Git Spritz" bug spray to lip balm to "tub teas," a teabag of herbs for the bathtub. All of the products are made from natural herbs. The Mount Joy Farmer's Market is open each Saturday until Oct. 11 from 8 a.m. until noon in the parking lot of Union Nation Bank, 101 E. Main Street. Sams still edits and publishes "The Essential Herbal." Subscriptions and more information are available at www.essentialherbal.com. Thanks Maryanne :-). So that means that I need to answer 5 questions and then tag some other players. Okie Dokie. I was trying very hard not to concentrate on how unhappy my marriage was. I had a 7 year old who was the light of my life (still is! ), and the shop was growing by leaps and bounds. We were giving the weekly classes on Friday nights, talking to groups at least a couple of times a month, and staying very busy. The Herbal Adventures of the Twisted Sisters (currently out of print, but we're working on that) had just been printed, and we were having a ball with that. It would be easier to list things that I don't like, but I LOVE Mentos mint chews, crystallized ginger, almonds, pretzels, and Wheat Thins. Fresh fruit is always good this time of year. Really... no kidding, I like just about everything, and it shows. I'm going to pretend that a million dollars is a lot of money like when I was a kid. First I would double the size of the magazine and send writers on great assignments. *Maybe* we would use color. Then I would strong-arm my sweetheart to retire and relax a little bit. I'd make sure Molly had a great education and a little cushion to get started on, some security for her. Not too much else would change. Make sure the people I love are ok, mostly. A vacation now and then sure would be nice, though. It would be nice to travel around the US and see it up close. Maybe leave the country. New Zealand and Australia sound interesting. Other than a brief ill-fated sojourn into beautiful south central VA, I'm a Lancaster County girl, born and bred. The only place I've ever visited that I wanted to move to was Bermuda. Then again, there's a lot I haven't seen. Last year we started what seems to have become one of my favorite new traditions. I was participating in a "Home Grown" swap, and needed about 25 wands. We just kept going and had lots to take to market and put up on the website. It was so much fun at the end of the day to catch a cool breeze and catch up. We've been looking forward to it for months, and now the lavender is ready. At some point during the day, I pick a sheaf of lavender and allow it to wilt a bit in the shade. When the sun goes low enough that shade hits the deck, my sister (and this year her son) comes up to weave. Supper is done and washed up, and there is nothing left to do but just enjoy ourselves. This year there is so much lavender that we pushed it and went from 19 to *about* 25 stems. I say about, because nephew Rob is a math guy. It is impossible for him to just simply weave. Oh no. He has no choice but to try to figure out mathematical sequences that will turn out interesting wands. He even did one with two colors of ribbons, but said, "never again", so that one is now a part of the family trivia collection. Of course we see what he turns out, and then we have to try it too. We turn up each night with new ideas. I'm percolating a stair-step weave right now. We have a few more evenings of weaving, stopping at 50 before we try distilling some of the flowers. The wands are available on our website and the book, Under the Sun (also on our website) has written instructions with photos. Last week we were coming home from the post office, and right there where the peaches will be in another month were these gorgeous cherries. We have this great farm stand where they sell the county's best peaches every year. After peaches they have many varieties of apples. This is the first year for cherries, though. http://theessentialherbal.blogspot.com/2007/08/gobble-up-some-cobbler.html and just slightly altered it. Instead of lemon juice (which I didn't have on hand), I squeezed an orange over the cherries and sugar. This recipe is like a giant cookie - all terrible ingredients. It would be improved with the use of raw sugar and a whole grain flour, but once or twice a year we make it just the way the recipe suggests. It is so simple, just a few ingredients, and it looks so delicious before it goes in the oven. 40 minutes later... ummmmm umm! The edges are just a little crispy and the cherries are perfectly suited to a cobbler. The latest issue is starting to reach subscribers and shops, so it's time to post it here. We've got another great issue out. It's full of great summertime ideas and helpful information. There are some recipes and good instructions for using the herbs that are out there this time of the year. We've been blessed with many wonderful writers and advertisers. If you'd like to be a part of the magazine, drop me a line and we'll fit you in! When Tina Sams was a child, her grandfather, who knew all the herbs and their uses, would point out the plants to her. "Through that I developed an interest in herbs myself. That passing of herbal knowledge to other generations is important," she said. To do that herself, the Manheim-area resident and editor of The Essential Herbal Magazine has edited and published a new book, "The Essential Herbal: Under the Sun: The First Five Years. "It's a compilation of the best articles from the magazine's spring and summer issues from 2002 to 2006. The magazine, which began as a newsletter in 2002 and morphed into a magazine in 2004, is now published bimonthly. "There's so much you can do with herbs and a number of ways to use a specific herb," Sams said.She noted that the interest in both growing and using herbs for both culinary and medicinal purposes has grown over the past year or so. "It goes in cycles; herbs were popular in the '60s, and now they're popular again," she said. Sams and her sister, Maryanne Schwartz, began operating a seasonal herb shop at the Pennsylvania Renaissance Faire in the early 1990s. Soon they had a retail herb store in Landisville, which they sold several years later. Today they share a stand at the Mount Joy Farmers Market. Schwartz, owner of Lancaster County Soapworks, also collaborates with Sams on her magazine and books, doing layout. Three years ago Sams published "Wild Foods for Every Table," a spiral-bound cookbook and field guide, partly based on the magazine content. "The writers who contribute to the magazine are like me: They want to share what they know with others," she said. Sams' new 224-page paperback, published in May by The Sibling Group, Manheim, has more than 100 food recipes and ideas for the kitchen, better health, herbal first aid, gardens, crafts and herb-based businesses. The book is available for purchase 8 a.m.-noon every Saturday until Oct. 11 at the sisters' stand at the Mount Joy Farmers Market, located in the parking lot at Union National Community Bank, 101 E. Main St. 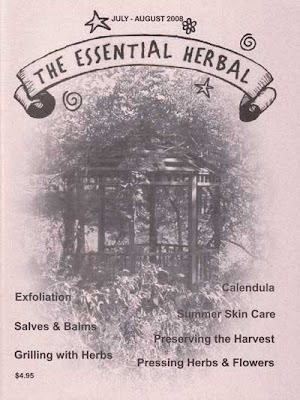 It is also available at the magazine's Web site: http://www.essentialherbal.com/. I just got in from Sense of Wonder Camp, where I taught the girls how to make herb beads using the method I developed and published with instructions in Under the Sun. They were guided by Park Ranger and Naturalist Lisa Sanchez - who uses some of her vacation time every year to lead this wonderful camp - to gather leaves from plants that smelled good, and I took along some freshly ground peppermint, lavender, rosemary, oakmoss (that was an experiment that needs some work, although it will be worth it), and red and yellow sandalwood. The girls had piles of spice bush and sweet cicely waiting when I got there. They also had unripe black walnuts, which would have had a great scent, but we couldn't grind them. One of my oversights which turned out to be a spectacularly good thing was that I forgot to take along any finished beads as examples. It hit me in the car, but instead of going back to the house to get them, it seemed like maybe they would do better if they followed their own whims. They did a GREAT job, coming up with unusual shapes and sizes that would never have happened if I had shown them the small, regular round beads that I usually make. Unfortunately, even though the camera was ready in my purse, 22 spirited young'uns made me completely forget to get pictures until we were all headed out to the creek where they were excited about swimming. The deep red sandalwood and the bright green sweet cicely looked beautiful next to beads made from less brilliant plants. The oakmoss looks almost silver. I really regret not getting pictures of the girls working on their beads. 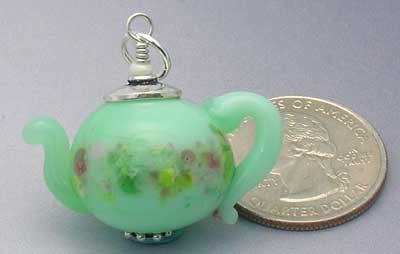 But speaking of beads, my sister has started working on tiny teapots. She has made several of them using glass rods and an oxygen torch. You can see quite a few on her blog, but my favorite is this green one that looks like a miniature antique. I adore the way the frit she used along the sides look like tiny roses and leaves. In a minute here, I'm going to head out and replant the garden that was too chilled early on. All of the vegetable seeds decided not to come up. Luckily, I saved 1/2 of all the packs, so we'll just have a late harvest this year. The produce from the Mount Joy Farmers Market will serve in the meantime (and beyond!). Oh - and we spent the day yesterday at Penn State/Hershey Medical Center with a relative who needs to get on a transplant list. They did ALL of the testing and conferences in one day, and gave us some very good news. All in all, it was one of the most grueling 12 hour days we've spent in a while. Someone should have told me that the instructions mentioned packing a lunch, because by the time we got out of there I was ready to gnaw on the car seat. I got home to find that someone, somewhere (thank you, whoever you are!!!) posted an old blog entry to an email list, and hundreds of people came to read. Several decided to subscribe to The Essential Herbal. It was a good and tiring day :-). I've been cutting the Munstead Lavender daily for about a week, and putting in bunches for market. That is almost done, and the buds that are left have mostly flowered. The Munstead is really beautiful, and until you see it next to the Grosso, it doesn't look like such a pipsqueak. These in the picture are about 8" long. The bunches that went to market looked nice wrapped in white tissue cones. For a deep purple flower with a nice scent, Munstead can't be beat in our zone (5b). The Grosso stems are well over a foot long with spikes over 3" on some. They will be left to wilt today, and then Maryanne and I will spend the evening on the back deck weaving wands. I stocked up on ribbon last week when I found it on sale. After working all week with the Munstead, I almost waited to long for the Grosso. You can see that some of the buds have flowered. It is just so pale that it can be deceiving. The other plants will be ready within the next week or two. By the time we've plowed through one or two plants' worth of wands, we'll be ready to toss some into the still just to do something OTHER than weaving with it. This will be the first year there will be enough for that, and I can't wait! Ah.... we are finished with the wild hubbub of herb festivals for this year. We still have that one big hairy weekend (the Twisted Sisters' PA tour, as we like to call it) in July, but otherwise it's just the Saturday morning farmers market in Mount Joy for a while. It has taken me almost a week to get around to this blog entry. The July/Aug issue of The Essential Herbal was delivered while we were away at the Alloway Creek Art and Garden Festival, so for the first half of the week that needed to be prepared for mailing. It has become quite an operation - first the bulk mail to the subscribers is prepared and taken out to the PO, and that is followed by the shop copies, writer's copies, and the advertiser's copies. Sometimes it takes me well over a week to accomplish, but I'm patting myself on the back to have gotten it done in short order this time with no loose ends hanging. Last Friday and Saturday we set up at Barb and Roger Steele's herb farm to take part in their festival. The kids were all set to handle the farmers market, and we'd packed two complete "sets" of crates - one for them, and one for us. The weather turned HOT just prior to the weekend, so we girded ourselves for that, but I must say that there was really no preparing for the heat that arrived on Saturday. Nuff said there. One of my favorite things about going to Alloway is the gardens. I feel the same way about The Rosemary House, or when I visit Sarah Campbell's labyrinth. I LOVE the people, but really, really enjoy seeing the way other people create gardens. All of them add touches of whimsy and demonstrate unusual techniques or ideas that inspire me. At Barb's, I saw my first lavender hedge, something that stayed with me, nagging, until I had my own long row of lavender along the split rail fence out back. Herb and veggie plants are huge this year. It always is something you see at herb festivals - people loaded down with boxes, flats, wagons, and wheelbarrows full of plants. It really seems to me that there are more people gardening than ever before. A tomato plant here, a basil there, maybe a pepper or two. We all have to start somewhere, and it feels like more people are starting this year than ever before. The current tomato scare will only fuel that, especially following the problems we've had with lettuce, etc. in recent years. These poppies were some of the most photographed flowers of the garden. They are so strikingly beautiful and colorful. Who could resist? Barb Will of Sugar Grove Herbs in Somerset was there with her garden decor. The wooden star beside her is a historic reproduction of barn stars from Somerset County, and they are made by her husband, Fred. There are some really beautiful stars and I'm still trying to figure out where and how to put one on my house because they are so cool. I snapped some more pictures over the weekend because everything was so lush and gorgeous, full of blooms. I wish I could have captured the constant bird-song on a picture. That was extraordinary, and we were just far enough south to see several varieties of birds that aren't around here. This elderberry bush is perhaps 20" wide and just as tall. It was covered with the elder blow. There is something so delightful about the flowers, so delicate and sweet. There will be enough berries on this bush to keep the birds happy for a while, with enough left over to create some syrup, tincture... and maybe even dry some. I don't know what Barb does with them. There are probably several bushes in the fields surrounding the farm. This is our tent, nestled in right under the paw-paw grove. That really helped to keep us in the shade. Little gold no-see-ums seem to like paw-paw trees. They liked us too. We used some of our Git Stick the first day, and escaped their wrath, but forgot on Saturday. Maryanne's legs got pretty well eaten up. You can see the standing displays below. They were just put together during the week prior to the show. They kept the lipbalms and the lotion sticks up-right and miracle 0f miracles, we didn't have any melted product. However, we did lower the tent overnight on Friday, and condensation dripped on some of the shrinkwrapped soaps. About 10 bars needed to be unwrapped and air-dried for a while. No problem, though. They're fine. This little potting shed catches my eye every year. See the elderberry bush beside it? That's just a wee portion. I don't know what the thistle is growing in front, but I just love the way it was allowed to grow in front of the door. There's that whimsy. The yellow striped tent held about 6 vendors. There were some unusual hostas and water plants, along with some antiques and one booth with some really fascinating artwork done with found objects. I really loved her stuff, and regret not getting a particular box from her that was decorated with baubles, glitter, and dolls heads. It was just so out-there, and even though it sounds weird (well... I guess it was, really), it turned out to be a thing of beauty. Last time we did this show, we shared the yellow tent, but decided to be stand-alone this time. It's fun both ways. Tina one - Weeds zero ...for today anyway. We've had a couple of beautiful days here. Mild temperatures, low humidity, and a nice breeze. These were about the first really perfect days we've had for a while, with cool and wet being the typical forecast in May. So, like any self respecting gardener, I set about reclaiming the gardens. They aren't all under control, but it is a darned sight better than it was. There really should be some "before" pictures, but honestly that would have been to embarrassing. To begin, let's start out with my $1 wheel barrow that I found at the barn sale down the road last week. Don't ask me why (or even how) I've been working on all the different areas here without one. It was ridiculous. So that would explain why I swerved into the farm lane and tossed this baby into the back of the car. It reminds me so much of my first car. Looks like crap, but does a fine job. The fact that it's already been WELL broken in means that I won't have to feel bad about scratching it with a shovel, or leaving it out overnight when it might get a little rust. The row of Grosso lavender is getting ready to bloom. You can see here the thousands of spikes starting to form. It's time to stock up on some ribbons for wands, and this year we'll have plenty to sell in bunches at market. Maybe enough to distill, too. Just a few short days ago it was hard to tell where the field ended and the row of lavender began. Is it just me? Or do all gardeners suffer anxiety attacks when their gardens are looking invaded? Just looking at that crisp row makes me feel so much better! The Bergarten Sage in the foreground is just barely blooming this year, spending all of her energy on putting out those lush leaves. That's fine with me. The leaves are the part we use anyway. At the far end of the lavender row we have a lush Lemon Thyme, some Mountain Mint, and Tarragon. They form the corner of the berry patch (protected by the lattice panels). Inside are lots of blueberry plants and some very healthy elderberry bushes. The blueberries aren't doing anything except growing yet. Same with the elderberries. I'm hoping that the warmer temps and the mulch will give them a little shove in the direction of blossoms. If not, there's always next year. However, 2 of the blueberries that I had considered nibbled to death by the rabbits or groundhogs have decided to start growing again. That was a pleasant surprise. Those varmints chewed them off right down to the ground. An elderberry facing another direction is already in bloom, but the leaves are yellow - possibly too close to a white pine? This is her third year. Last year there was just one umbel. The frothy elder "blow" is such a pretty thing. It's hard to decide whether to harvest the flowers or wait for the berries (and fight the birds for them). The birds are incredible this year too! Yesterday I saw an Oriole, brilliant orange swooping over the pines. The Gold Finches are everywhere, and a hummingbird sipped at the chive blossoms. Bluebirds? Yeah, we've got 'em. In the middle of the yard is a little oasis of Chamomile. Just last week I picked off every single bloom for the still, and you can see that didn't give them a moment's pause. They just put out more flowers. They need another picking, but we're talking hours here. It is no small feat to pluck that many flowers. It is akin to picking the violets for syrup, except that the violets snap away from stem more quickly. Chamomile requires a small pinch to keep the stemmage to a minimum. It's such a cheerful little spot. I love to sit in the grass next to the patch, and watch the sun go down over the flowers while picking. Out by the front door is the Valerian. It is in full bloom now, and the scent is amazing. Off to the left is an old-fashioned, late-blooming lilac bush. The day the lilacs stopped perfuming the entrance, the Valerian went into bloom, giving us a non-stop, breath-taking welcome to the outdoors every time we step outside. Soon we'll be greeted with Bog Sage and Bergamot, but nothing will again come close to the fragrance outside the door for the rest of the year. It's hard to believe after seeing all the seed pods (and picking those that were reachable), but so far the Moonflower hasn't shown up. Every year is a surprise. It never fails. Even if nothing new comes up, there are always plants that were forgotten somehow, and as they show up it's a little gift to brighten my day. For instance, out in the front garden there is a Munstead Lavender that is starting to bloom. Next to it is a smaller version that came up on its own last year. It has a couple of little spikes this year. This is the first time I've ever had a lavender mom and baby. That was one of those great surprises!